As customer service and the overall customer experience become key differentiators for brands and organizations across all industries, it has never been more important to know as much as you can about your customers and their expectations for service and engagement across channels. The newly-released 2015 U.S. State of Multichannel Customer Service Report published by Microsoft Dynamics CRM and Parature, from Microsoft shows that consumers now use at least four different channels regularly when interacting with a brand or organization for customer-related questions and issues. With more than half saying that their initial customer service interaction now begins online, this year’s survey notes fast-growing expectations for online self-service. In fact, 92% of the 1,000 consumers surveyed for the report say they now expect a brand or organization to offer a self-service customer support page or portal, and 61% have a more favorable view of the brand or organization if its online self-service offering is mobile responsive. These statistics tie in to a growing desire for speed and convenience, as consumers in this year’s survey once again said getting their issue resolved quickly was the most important aspect of a satisfying customer service experience. 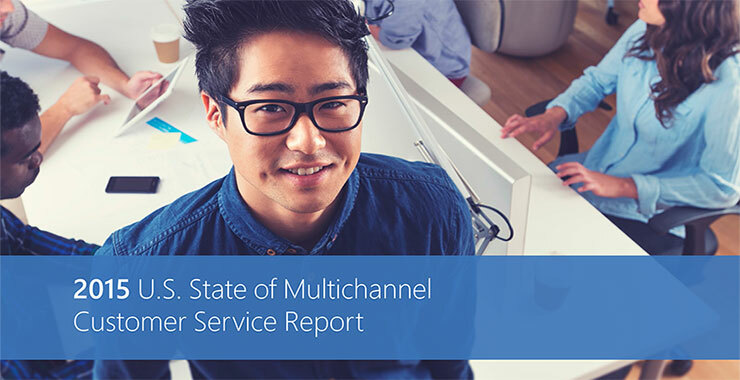 The 2015 U.S. State of Multichannel Customer Service Report also takes a look at current social customer service expectations, showing that more than half of consumers now expect a response from a brand or organization within 24 hours. Think customers only engage on social to complain about brands? This year’s survey shows customers are more likely to praise a brand for great service on social media rather than complain about a poor customer service experience. and more (watch for the 2015 U.K. State of Multichannel Customer Service Report coming in August 2015).